Steals from others every day - in fact is a shoplifter! The sun became full of light when it got hold of itself. Angels began shining when they achieved discipline. The sun goes out whenever the cloud of not-praising comes near. The moment that foolish angel felt insolent, he heard the door close. I’ve been looking for a way to reframe the word “crisis”. Somewhere between panic and escapism, there must be a response to profound change that affirms what remains good within and around us. There must be a response that invites possibility for making our world even better. With Pluto’s ingress into Capricorn, we have been experiencing some profound shifts. Just as Pluto likes to do, the ground has opened up, exposing what we misuse or take for granted about Capricorn issues. We have some things to look at. I need a new way to approach this investigation. This month’s New Moon is in Sagittarius. Sagittarian energy is celebratory. It is hopeful and expansive. We can use these qualities to remember why we are grateful—what is good about our lives. In spite of all we may be feeling and hearing about crisis right now, the act of praising is an antidote to despair. This New Moon in Sagittarius takes place on Thanksgiving this year—a cosmic reminder that praising is an important spiritual practice. All beings, to my body I give praise! To my family, I give praise! To the beauty in this room, I give praise! To the abundance around me, I give praise! To the heartfelt connections with friends, I give praise! This breaks the spell of despondency and I reconnect to the energetic flow of possibility. Jupiter, the ruler of Sagittarius, is a good ally for learning how to reframe despair. Right now, Jupiter is traveling through the last degrees of Capricorn. It entered Capricorn December 2007 and will leave for Aquarius in the next lunar month. During this Sagittarian season, Jupiter may be the best guide for teaching us how to embrace crisis as opportunity. Through Jupiter’s gift of storytelling, we may be able to re-story how we will greet Pluto’s ingress into Capricorn. Instead of crisis, this is our opportunity to redefine what we mean about Capricorn issues like wealth, authority, and success. What about these things haven’t been working for you? What about these things haven’t been working for the world? How do we choose to redefine the very structures of our culture? If you have ever wanted a world that had a different relationship to money and authority, now is your opportunity! What can we create? What tools are you using to move forward? At the New Moon, Jupiter is conjunct Venus, trine Saturn, and sextile Uranus. This is all good. Venus rules both money and beauty. These things are not in conflict with each other but this planetary ally invites us to consider which is more important to us. My practice of praising reminds me that in the moment I am wealthy when I praise the beauty in my life. There is also a cluster of planets called a stellium in the first degrees of Sagittarius. The Sun, Moon, Mercury and Mars combine forces. This energy invites truth into our hearts and a willingness to act upon what we believe. We will want to expand our horizons this month. We’ve just elected a new president. As Caroline Casey says, we’ve just elected a new story. As we set intention at the New Moon, we may be able to animate that story with hope and action. 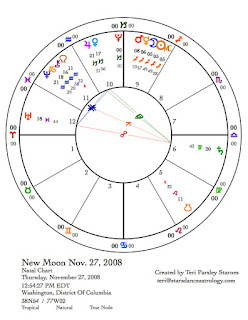 Uranus stations direct on the day of the New Moon, giving a strong tone of unpredictability to this month. The opposition transit between Saturn and Uranus has begun. We’ve reached the tipping point. The dialog between order and chaos continues to be relevant. All transits to Uranus (see below) will emphasize our desires for change. Uranian change often comes from unexpected places and in unexpected ways. 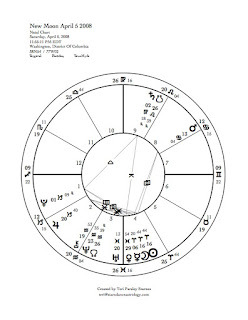 Transits to Saturn (see below) will emphasize structure and process. Saturn process slows us down and invites us to reconsider. 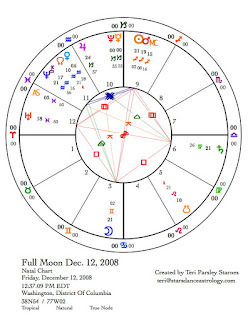 The Full Moon on December 12 is quite dynamic. There is a Grand Cross of planets. The relationships in a Grand Cross are challenging. The planets involved are the Sun and Moon, Mars, Uranus and Saturn. We may need to practice our tools for reframing the word “crisis” at this time. The transit of Mars to Uranus and Saturn will very likely trigger new expressions of the opposition between Uranus and Saturn. This is a good time to pay attention to the forces that are pulling us in opposite directions. How do we find the balance point between? The Sun enters Capricorn at the Winter Solstice on December 21. 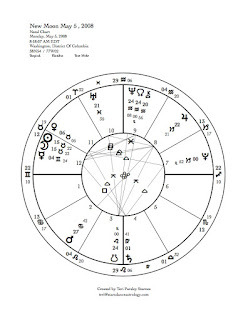 The chart for this moment is called the Capricorn Ingress. This chart shows us a map for the whole season. Mars features prominently in this chart as well. Mars relates to war, to action, to desire. In the Tarot, Mars corresponds to the Tower card. Structures may fall this season. 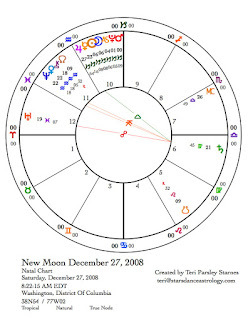 At the Winter Solstice, the Sun is conjunct Pluto within minutes of being exact. Both Pluto and Mars turn over stagnant forms so that we may revitalize them. The chart for the winter does not look particularly restful, yet we need the dark time of winter to dream and replenish. What are your tools for being present to the moment while seeing the larger picture? Jupiter rules the winter chart. In spite of challenges, we are called to dream the bigger dream. With the Moon in Libra, we will want balance and harmony. Perhaps this desire will help us find solutions to inherent tensions. 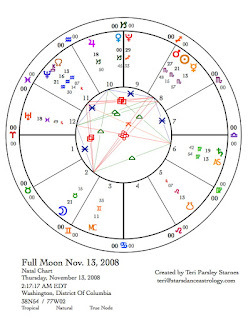 This Moon supports the middle path that Obama seems to be taking in his appointments to his cabinet. What middle path do you choose? Important dates for our story. Where I live in the northern Mississippi River watershed, the light at this time of year is dramatic. It is golden. The seed heads of the tall grass drink in this light and reflect it back to us. Now the Sun’s light slants long as it descends toward the temporary balance of the Equinox. There is still enough summer to feel luxurious about this light but the deeper shadows living right next to whatever is illuminated remind me that before long, we will return to death’s season. All artists know that it is the shadows that make the light special. This lunar cycle is full of light and shadow. We will experience two eclipses this month. 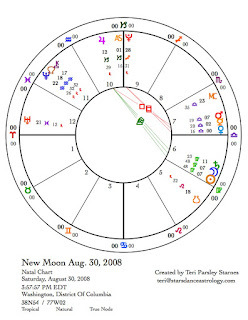 A solar eclipse at the New Moon on August 1 and a lunar eclipse at the Full Moon on August 16. During an eclipse, light gives way to shadow suddenly and then returns just as quickly. Eclipses set us upon new pathways. They have the potential to be quite dramatic. The dragon in the sky. Astrologers imagine the nodes as a dragon eating the light of the Sun during a solar eclipse and the light of the Moon during a lunar eclipse. The head of the dragon is the north node and the tail is the south. The August 1 solar eclipse happens at the tail of the dragon in Leo. 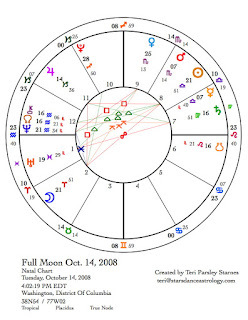 Our last solar eclipse [February 6, 2008] occurred at the dragon’s head in Aquarius. The south node carries the energy of the past and represents attitudes that need to be rethought, cleared away, reformulated. As the light goes out and comes back this month, we can all explore the ways we want to reframe the energy of Leo in our lives. Leo’s flame. Imagine knowing your self worth. Imagine being able to share your gifts with the world in perfect balance—being appreciated for who you are and what you have to give without needing to bolster a fragile ego by needing others’ approval. This is the pure potential of Leo, which we all have within us, and which I believe we all need to realize at this time of a Leo eclipse . Hope and self worth. We live in a time when hope is fragile, when we long for change that can make a difference, and perhaps when we wonder if our individual gifts could make any difference. A deflated ego says, I can’t make a difference and an inflated ego says, a better world is up to me only. Both states of ego get in the way of the possibility of being the change we want to be. Where Leo can get stuck is in one or both of these expressions of ego. As the light goes out and comes back at this new Moon, we have the opportunity to transform our ego patterns. Sometimes we can choose this path consciously, and sometimes the universe makes the shift for us. Eclipses are like that. This month, will you make a shift in how you value yourself? Can you imagine how this might change the world? Speaking of changing the world. We are in an election year. 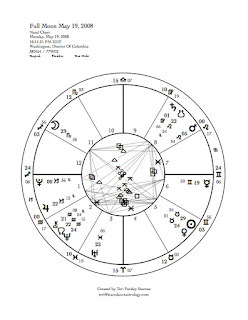 Our two major candidates, McCain and Obama, share remarkable astrological signatures. These signatures are relevant to this month’s transits. Both candidates share planets at the same degree of Leo. 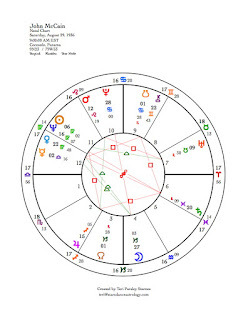 Obama’s Sun is at 12 Leo and McCain’s Mars is also at 12 Leo. This month’s eclipse is at 9 Leo. I usually do not consider a 3 degree orb [the difference between 9 and 12] to be applicable to an eclipse transit, however there is too much coincidence here to ignore. Something is up. Both of these candidates are experiencing this eclipse. This is interesting and I have no idea what it means. But I suspect we will find out, and perhaps this month. Why? As I write this, Saturn is at 6 Virgo and later this month, on August 6, Mars and Uranus will oppose each other at 22 Virgo. The coincidences continue. 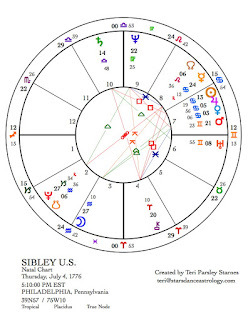 I am most fascinated by the fact that in the U.S. birth chart [the Sibley chart], Neptune is also at 22 Virgo squaring Mars at 21 Gemini. Something important is happening in our nation’s history and destiny with the candidacy of these two men. The current transit of Uranus in Pisces and Saturn in Virgo are poised to expose what this is. 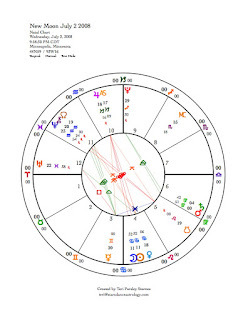 The square of Neptune to Mars in the U.S. chart signifies our national attitudes and experience with war, will, and leadership. We often engage in these energies under the illusions of Neptune. We fantasize that willful action can solve our problems. And sometimes our greatest dreams do spur us to action that is positive. But obviously, we have a lot to learn about using our muscles to solve our problems. Neptune makes sure we stay on the course of surrendering the old forms in order to evolve. The potential to do away with the mistakes of the past is very strong right now. The question is, what we will replace it with? Will the winner of this election be able to create the change we need? Who must we rely on to create the world we want to live in? 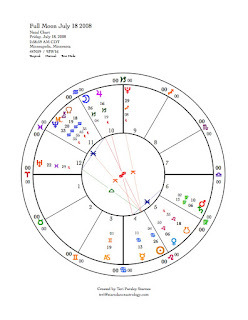 Saturn moving through this pattern says, wake up to your own responsibility. Uranus traveling through this pattern says, the time to change is now. Back to the eclipse: Leo says, how will you change your self-perceptions to make way for authentic participation in this grand story? August 1 is not only the new moon, but it is also the cross-quarter holy day of Lughnasad—the time to honor our first harvests and pray that the fall’s harvest will be bountiful. The Sun is our ally of the harvest. We are also Suns. We are the allies of the future’s harvest. This is a potent time to claim our own Sun’s energy. 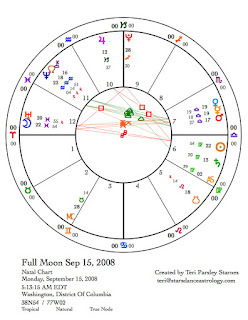 The full Moon on August 16 is a lunar eclipse at 24 Leo/Aquarius. This is the time to realize what energy Aquarius contributes to recovering the wholeness of self. Aquarius is the collective and it is the impulse to embrace the future. An individual can change the world but we also need to work in groups to manifest our future. The give and take between these two signs creates something greater than the sum of its parts. At this full Moon, we might reach a breaking point or crisis in the balance between these two signs. 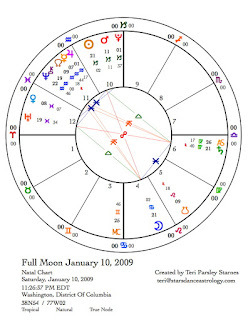 Mars square to Pluto in this chart signifies possible eruptions. Pluto’s job is to release the shadow. As the light goes out of this full Moon, look within the shadows to claim your power. In Minnesota, the weather has had a hard time turning to spring. Snowflakes fell here last week and are predicted tonight as I write this. Even though the lingering cold is somewhat tedious, I am glad that this spring is more normal—more like what it is supposed to be like in April and early May in Minnesota. I know how to relate to this slowly awakening earth, the rhythmic rising and falling of sweet sap, the brave ephemerals blooming under frost, and the glorious, warm sunshine when it does appear. In spite of a beautiful, slow-blooming spring, we still know not all is right with our Earth and our relationship to nature. As inspired astrologer, Caroline Casey, likes to say, the situation is dire. Astrologers have been noticing the effects of outer planets in the earth signs. 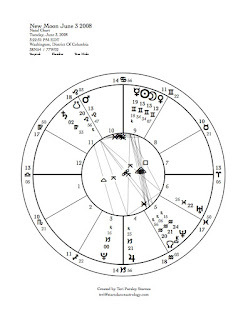 Pluto in Capricorn has manifested as the housing/oil prices crisis. The old way of doing business, a Capricorn issue, needs to change. Jupiter in Capricorn is helping with the global transition into dealing with difficult Capricorn issues. Saturn in Virgo has manifested as increased attention on how we can make a difference in our Earth crisis. In the April 20 edition of the New York Times Magazine, Michael Pollan, author of the Ominvore’s Dilemma, wrote a wonderful article about how small individual efforts to change the world just might make a difference. The title of the article is, Why Bother? Saturn encourages slow and steady work. Virgo says pay attention to every detail, every connection, to achieve health and wholeness. The third earth sign, Taurus, has been dormant until this spring. Now we can add an important ingredient to our earth stew. Taurus contributes the force of beauty, attention to what our bodies need, and an invitation to explore our relationship to true abundance. 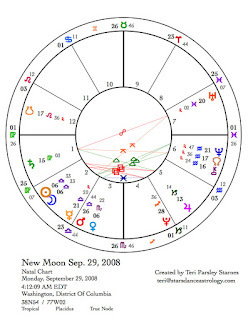 This May New Moon occurs exactly midway into Taurus, a fixed sign. 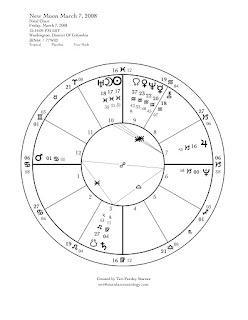 The midpoints of the fixed signs, Taurus, Leo, Scorpio and Aquarius, are powerful points in the turning of the year’s wheel. Pagans celebrate the cross-quarter sabbaths at these times. Although May 1st is the customary day on which Beltane is celebrated, the astrological Beltane happens when the Sun reaches 15 degrees of Taurus, around May 5th each year. This year, the Moon joins the Sun on this day heightening Beltane’s power to invoke the renewing power of the good green earth. This year, Beltane’s invitation to honor the earth and all beauty within and around us is in effect for the whole lunar cycle. The pattern for working with the Moon is to set intention at the new phase. As the Moon waxes during the first two weeks we take action on behalf of those intentions. At the full phase, we receive the illuminating light of our efforts. During the waning part of the Moon cycle, we share wisdom and begin to surrender form into compost. All dreams and efforts on behalf of those dreams make rich humus for the future. 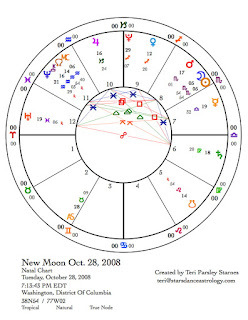 There is a grand earth trine in the chart for the New Moon. A grand trine represents harmonious power if we tap the resource. We have to consciously choose to engage the energy of a grand trine. In this earth trine, Saturn ,the god of manifestation and form, Pluto, the god of transformation, and Venus, the goddess of love and beauty, are representing this power. Although Pluto and Saturn remain in their earth domains, with Pluto taking a short hike back into Sagittarius this summer, for a significant time into the future, these two planets will only remain in this trine relationship for this month. And Venus moves quickly, she will leave Taurus on May 24. This is a good month to invoke and practice earth wisdom. Venus rules Taurus. As part of my earth practice this month, I will be paying extra attention to the following Venus transits. May 17 thru May 20 is a particularly potent Venus time. May 17 Venus is square to Chiron. Noticing the wounds around relationship with beauty, Chiron invites us to become the healer and teacher. May 18 Venus is sextile to Uranus. The opportunity to engage our revolutionary spirits in the cause of beauty. May 19 Full Moon. Illumination in the last degree of Taurus. The balance of death (Moon in Scorpio) with rebirth (Sun in Taurus). At the Full Moon, Venus is near the Sun and is square to Neptune. 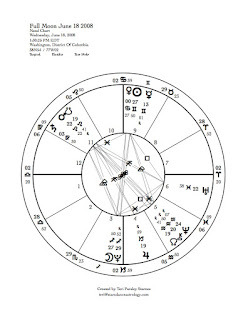 Venus’ potential in this chart is to integrate the polarity of Taurus and Scorpio. Looking with clear eyes at our fears and our authentic needs for survival, we can ask, What do we really need? Neptune’s role is to show us how we escape into the nearest shiny thing, without thought of impact or authentic desire. What does authentic desire mean to you? Is it something found on TV? Is there a place in nature that teaches you how to be authentic to your own desires? What small action will you take to reconnect with the Earth? How will you let beauty lead you into soul redemption? These are some of the questions I hold this lunar month. At the Full Moon, may there be progress in my soul to claim my birthright of beauty, balance and delight, as my friend Donald Engstrom prays daily. May 20 Exact square between Venus and Neptune. Illusion is a teacher; dream is a teacher also. How are you being taught by your illusions and dreams? Neptune brings awareness of longing, grief, and transcendence. How do you honor all these feelings? 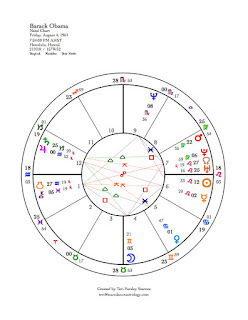 Venus leaves Taurus on May 24 and enters air sign Gemini. Awareness moves from body to mind. Now Venus challenges and is challenged by transformative Pluto and responsible Saturn. May 25 Venus is quincunx to Pluto. She stretches to find a way to align thought with necessary regeneration. May 26 Venus is square to Saturn. Venus challenges us to think and communicate about action and service (Saturn in Virgo) to our beloveds. Venus’ natural mode of operation— to inspire and invite— is challenged by Saturn’s practicality. What is the disconnect you feel around desire and action on behalf of those desires? Saturn is here to teach that lesson. There are other astrological themes this month, which contribute to the celestial seasoning of now. 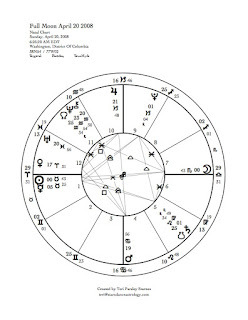 May 26 Mercury turns retrograde at 21 degrees Gemini. On May 11, Mercury enters the foreshadowing phase of this retrograde period. Mercury remains retrograde until June 11 (stations direct at 12 degrees Gemini). Mercury leaves the entire retrograde zone of the zodiac on July 4. Mercury, the trickster God, rules Gemini. 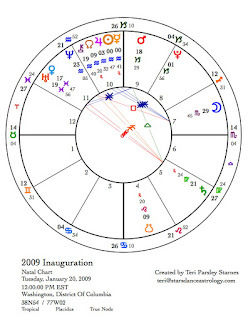 This particular retrograde cycle should be interesting, especially in the arena of politics. 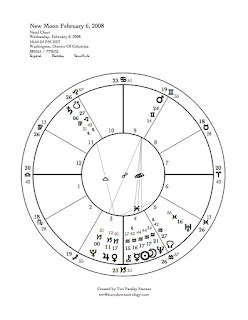 Clinton has a natal retrograde Mercury in her chart and Obama’s Moon is at 0 degrees Gemini. The candidates are going to feel the trickster who will be asking us all to rethink, re-express, and think quickly in response to rapidly changing circumstances. 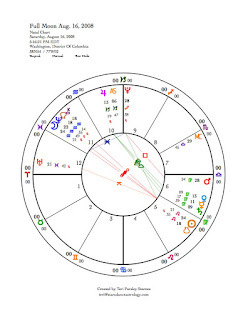 May 26 another planet turns retrograde—Neptune—at 24 degrees Aquarius. Every planet becomes stronger when it stations retrograde or direct. 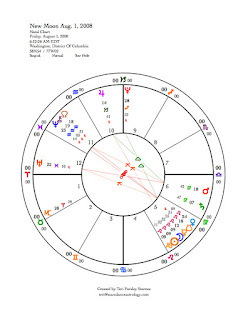 Along with Mercury stationing on the same day, this should be a time of strong intuition and uncanny insight and perhaps not such a good time for logical thought processes. May the blessings of the good green earth be with you this season.